I used to be addicted to diet iced tea made with artificial sweeteners and when I decided last summer to make some healthy changes, reducing artificial sweeteners was one of them. I knew that plain water was too boring of a substitute for my iced tea, so I did some research and came across hibiscus iced tea. This tea is made from the dried calyces of the hibiscus flower, and I order large kilo sized bags of dried hibiscus flowers online. 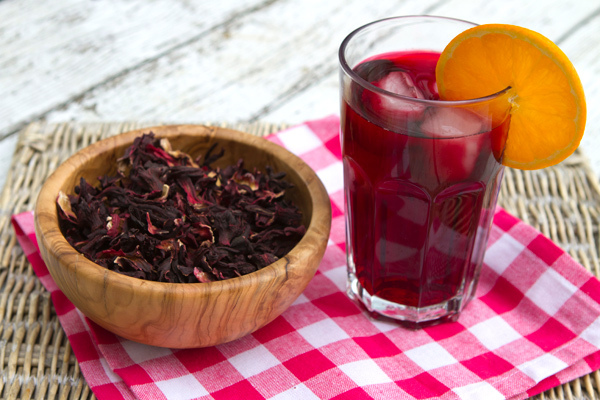 Because hibiscus tea is an herbal tisane, it is naturally caffeine free as well which is another bonus. I learned that hibiscus tea, both hot and cold, is a popular drink throughout the world and after a year of drinking it I understand why. The tea has a naturally tangy flavor (think cranberry), that is a little sour. Depending on my mood, I might sweeten my tea just a bit with some stevia or honey, but I have learned to enjoy it unsweetened as well. 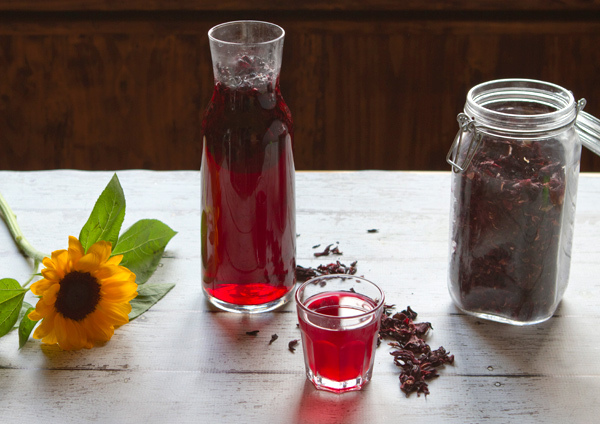 Hibiscus tea not only tastes delicious, but it has a number of health benefits as well. It is packed with vitamin C and antioxidants which helps support your immune system and protects us against chronic diseases, such as heart disease, rheumatoid arthritis, diabetes, and even cancer. 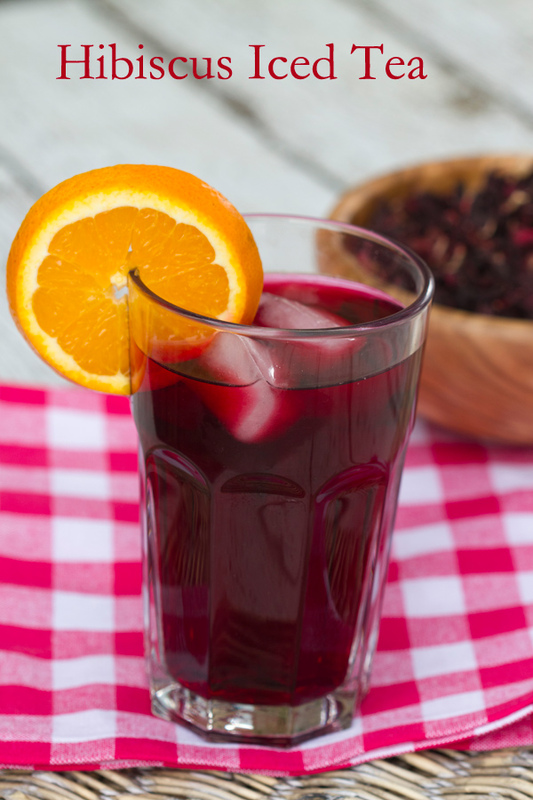 Studies have also shown that two to three cups of hibiscus tea a day can lower your blood pressure. 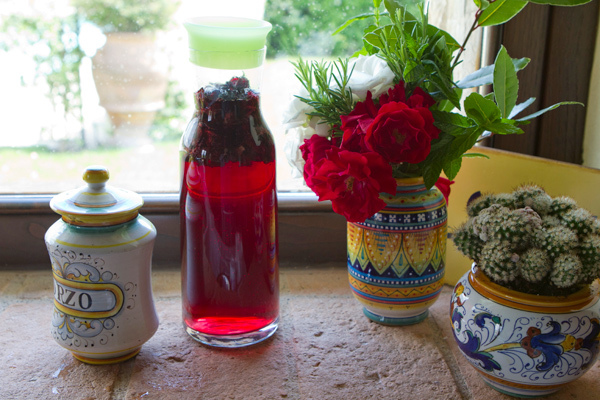 I make my hibiscus tea by pouring boiling water over the hibiscus flowers and letting it steep, then straining it. I also sometimes simply fill a jug with water along with the flowers and sit it on my windowsill in the sun until it turns a bright ruby red color. Once my tea is ready, I may sweeten it and then I pop it into the refrigerator to cool it down. When steeping your tea, you can also include some fresh ginger, mint leaves, or even a couple of green tea bags. I sometimes make my tea a little more concentrated by reducing the amount of water, then I add soda water to it, creating a very refreshing summer drink. Of course, you can also drink this tea hot! Simply steep a teaspoon or so in a cup of hot water, let steep five minutes and sweeten with honey. Hibiscus Flowers are caffeine free and rich in vitamin C and antioxidants. Studies show that hibiscus tea can reduce blood pressure, while the antioxidants boost the immune system and help prevent chronic disease. This drink is naturally sweetened. In a large pitcher, add the hibiscus flowers, then pour the boiling water over. Let step until the tea is a bright ruby red, about 30 to 45 minutes. Serve on ice with a slice of citrus.